The worsening crisis and renewed economic offensive of imperialism to further advance neoliberal globalization have aggravated the impact on and worsened the conditions of indigenous peoples, national minorities, oppressed nationalities and nations of the world. In the past decades, imperialism under the banner of neoliberal globalization actively pushed the liberalization of trade and investment, deregulation, privatization and denationalization of the economies of the world’s nations. Today, imperialism aggressively aims to fully liberalize trade and investments, remove all barriers of national protection, and expedite the unhampered exploitation of human, capital, and natural resources. For the indigenous peoples, national minorities and oppressed nationalities, the current thrust of imperialism only continues and further facilitates the plunder of the world’s natural wealth; and heightens State repression and gross violation to their rights to land, resources, cultures and collective identities. The aggressive imperialist plunder of land and resources and the heightened State repression is led by the United States and other imperialist powers with the willing cooperation of their client nations and puppet states. The local states have legitimized through laws, policies and programs the unhampered entry of large- scale resource-extractive ventures in line with the neoliberal globalization policies in domestic economies. Large-scale resource-extractive ventures operate and continue to expand in natural resource and mineral rich countries especially in Asia, Latin America and Africa. Destructive large-scale mining operations; agricultural mono-crop and biofuels plantations; commercial logging, agroforestry and industrial tree plantations; commercial fishing; oil and gas exploration and development; dams and energy -generation facilities; and infrastructure development such as oil and gas pipelines, roads, ports and transportation networks proceed without let-up and ravage the lands, plunder the resources, degrade and pollute the environment. Most adversely affected are the indigenous peoples, national minorities and oppressed nationalities who are dispossessed, displaced, forcibly removed, resettled from their traditional territories and are further marginalized. The severe impacts on the indigenous peoples, national minorities and oppressed nationalities have aroused and necessitated them to actively resist the imperialist onslaught to defend their land and resources, and assert their right to self-determination. At the same time, the United States and other imperialist countries have fortified and expanded their military deployments worldwide, increased political intervention in the domestic affairs of states and even brazenly attacked or invaded sovereign countries to maintain their political and economic spheres of influence. States guided by the US-led global ‘war on terror’ and now directed by the US Counter-Insurgency Guide have also further institutionalized and strengthened national security measures in their countries and; heightened political repression and terrorism against people’s opposition and resistance. The indigenous peoples, national minorities and oppressed nationalities face the brutal repression of the state’s military, police, paramilitary and other state-sanctioned armed groups in retaliation to their fierce resistance to defend their lands, and uphold their collective and individual rights. Massive militarization of their communities, massacres, extra-judicial killings, abductions and forced disappearances, harassments and other grave violations of their human rights are carried out with impunity. In countries that contend with armed struggles of indigenous peoples, national minorities and oppressed nationalities and revolutionary movements, states have launched violent and brutal counter- insurgency campaigns ostensibly against these armed movements but have also targeted resisting peoples. The growing people’s resistance and the steady advance of armed struggles have obliged states to engage the armed movements in peace talks and negotiations. However, their insincerity to achieve a just, lasting and genuine peace are exposed. They aim to cause the capitulation or outright surrender of these armed revolutionary movements instead of addressing the roots of the armed conflict. Indigenous peoples, national minorities and oppressed nationalities remain undaunted. They courageously persist to launch local campaigns and struggles against the parallel threat of imperialist plunder, and the relentless political repression against them. They engage in legal, parliamentary and open militant struggles. Some indigenous peoples, national minorities and oppressed nationalities have opted to wage armed struggles or joined armed revolutionary movement in their countries. They continue to systematically project their struggles and raise these campaigns in various fora in the regional and international arenas. The movements and struggles of indigenous peoples, national minorities and oppressed nationalities further advance, intensify, heighten and escalate on a variety of forms, fronts and levels in their home countries. In the international level, the movement of indigenous peoples, national minorities and oppressed nationalities that identifies imperialism as the root cause of the enormous problems faced by the world’s peoples is steadily developing. 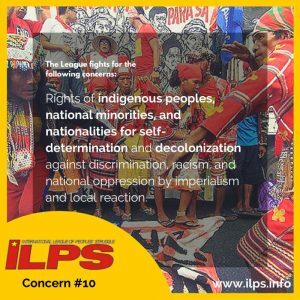 The challenge and task of the ILPS and the ILPS Commission 10 is to further sustain and strengthen the unity and solidarity of indigenous peoples, national minorities and oppressed nationalities at the national, regional and international arenas; and more importantly link this up to the broader progressive and anti- imperialist people’s movement that firmly stand for the right of peoples to self-determination and liberation from state oppression and imperialism. c) deepened discrimination and chauvinism towards indigenous peoples, national minorities, and oppressed nationalities. 6. Link up and unite the movements and struggles of indigenous peoples, national minorities and oppressed nationalities with the movements and struggles of oppressed classes and sectors, and actively participate in the struggles of the international united front against imperialism. 3) Influence the state policy-making processes related to indigenous issues. b) enact positive legislation, come out with policies, identify priorities and draft an action plan in line with the United Nations Declaration of the Rights of Indigenous Peoples (UNDRIP). 8) Increase the efficiency of the National Registration Department in the registration for citizenship especially for remote indigenous communities. 7) Advance indigenous peoples’ solidarity and struggles. 3) Build linkages and develop relations with other indigenous peoples who have the same interests and problems in other parts of the world. 3) Expand and strengthen solidarity relations with other groups on the national and global context.